AAATalks / Membership / 123 Drive! 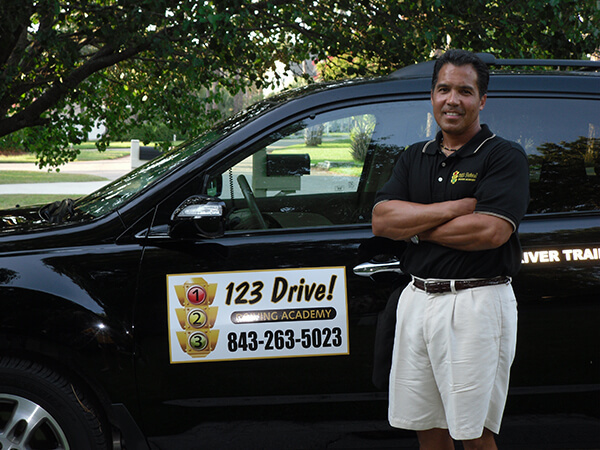 This month, we are highlighting AAA Approved Driving School “123 Drive!” Driving Academy. Co-founders Mark and Doreen have been running 123 Drive! since 2010 in the Hilton Head/Bluffton S.C. area. With eight state certified instructors, 123 Drive! is able to offer the community an array of different driving courses. Mark and Doreen are passionate about what they do and want every student to be road ready and safe drivers. And an added bonus: nobody will leave class hungry! Their snack selection at Saturday classes is amazing and students rave about it. Basic Teen Course: 8 hrs of classroom and 6 hrs of behind-the wheel training. Basic Teen Course with Road Test: 8 hrs of classroom, 6 hrs of behind-the-wheel training including the road test with a safety officer from the academy. Students are able to take their documents to the SCDMV within 30 days of completion to obtain their license. Premium Teen Course with Road Test: 8 hrs of classroom, 6 hrs of behind-the-wheel training including the road test. 123 Drive! will then accompany the student to the SCDMV to obtain their license. Add-on Package: Students are able to add 6 more hours of driving lessons onto any package. Refresher with Road Test: 2 hrs of instruction and the road test. Insurance Discount, Refresher and Test: 8 hr classroom training and 2 hrs of instruction along with the road test. 123 Drive! also offers 4 point reduction defensive driving classes for students to improve their driving record and reduce insurance rates. AAA members receive $25 off teen tuition and $10 off the 4-point reduction class. Military discounts are available as well as a sibling discount. For more information on 123 Drive! or to view the class schedule, please click here.